Kevin Costner delivered a moving, often humorous, but ultimately heartbreaking eulogy for his old friend today. The 57-year-old recalled the close relationship he developed with the late star when they worked together on 1992's smash hit movie, The Bodyguard. He talked about how much the twosome had in common, despite appearances to the contrary. Kevin then recounted stories of his childhood in church that Whitney enjoyed him telling her when they worked together. 'It was easy for us to laugh. The church was what we knew. It was our private bond. I can see her in my own mind running around here as a skinny little girl knowing everyone, everyone's business, knowing every inch of this place. I can also see her in trouble, too. Trying to use that beautiful smile, trying to talk her way out of it, and Cissy not having any of it,' he added. 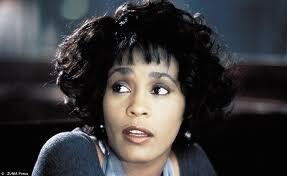 He spoke about how there was initial anxiety about having Whitney, a black woman, to play against Kevin Costner. But he said for him that there was a sigh of relief when it turned out that Whitney was going to be able to do The Bodyguard because she was going to be on tour and he felt so strongly about it that he would wait a year for so she would be available. ‘The Whitney I knew despite her worldwide fame, always worried. Am I good enough? Am I pretty enough? Will they like me?’ Costner shared. ‘A lot of men could have played that role. But you Whitney were the only person who could have played Rachel Marron. ‘People didn’t just like you Whitney. They loved you. ‘I was your pretend bodyguard once. And now you’re gone too soon. ‘I think Whitney would tell you, little girls wanting to become singers. Guard your bodies and guard the precious miracle you have. ‘Off you go Whitney, off you go. Escorted by an army of angels to your heavenly father,’ Costner said. Kevin and Whitney had deep friend relationship. I can even feel his sympathy through his eulogy speech. Click here for more eulogy examples.